Led by team of true animal lovers, WoofBox provides premium products to the most discerning pet owners packed in a surprise on a monthly basis. Just founded in early 2014, WoofBox was created to help pet owners discover healthy, brands at below retail prices. As and when one of our founders used to visit the per stores he used to easily spend around 1500 INR to get a few treats, toys priced at a huge premium. Disturbed with high rates he invited a bunch of true animal lovers to join him and this gave birth to WoofBox – a concept that eliminates need to visit pet stores just literally. Our team of true animal lovers help us procuring great treats, toys, goodies, and more directly from manufacturers which helps adding products at great rates so that your WoofBox is full of surprise every month. What sets WoofBox apart is the fact that the experts ensure to pick only products that are safe, innovative, treats that are yummy and healthy. 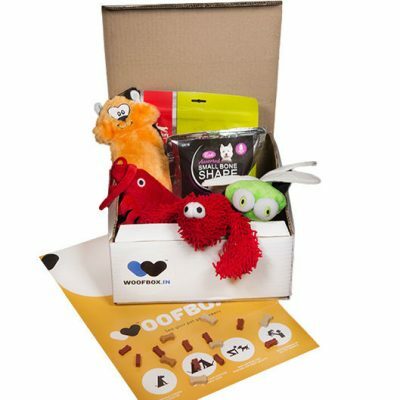 They ensure that no matter what happens, the moment your pet looks at the products in the WoofBox the tail goes wagging !